Slows attacked units by 12.5% for 5 seconds. 2nd tower of this family. Last edited by MasterCassim on Fri Jul 10, 2009 9:52 am, edited 2 times in total. 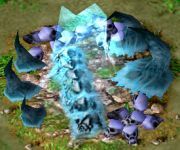 What does "Icy Ruins" have in common with "Icy Bones" (exept the term "Icy")? Im afraid nothing. So plz choose an other model and name. The theme of ur tower should be Bones + Ice (cause u started with this). So every tower of the family should fit this theme. - the Boneyard with some ice-effects. I know that you have good ideas : ) Thanks, I'll try to make something in this direction. I also think that are too many effects for such a "cheap" tower. Are that many crystals on each other? That will drop framerate unnecessarily since every crystal is rendered. Last edited by Natac on Thu Jul 09, 2009 10:36 pm, edited 1 time in total. blue effect isn't there (@alpha = 0). I have problems with my wc3 so I have to shoot the screens in the WE.